After commuting from Irvine to San Marcos for 2 ½ years, we finally sold our house and moved to Carlsbad. This was almost 13 years ago. 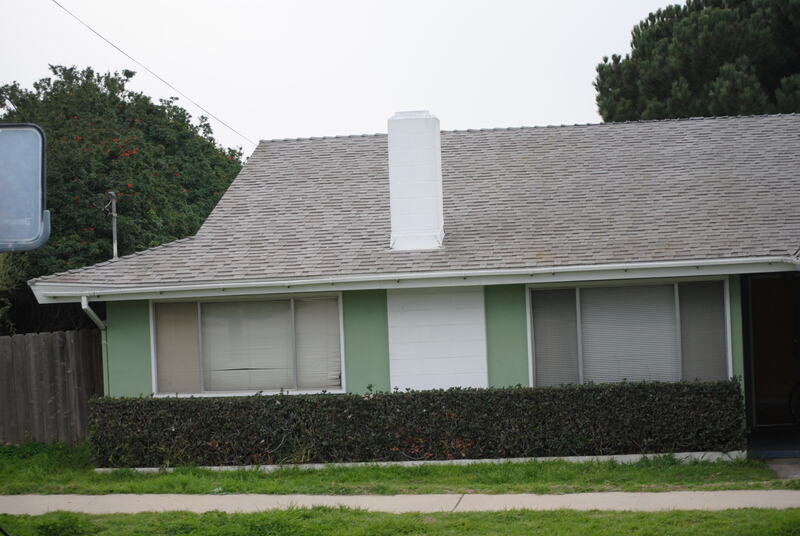 We started out in a rented, furnished condo in Aviara area with expansive ocean views. It sounds real nice, but I did not like living in a condo or in Aviara for that matter. I felt rootless and insecure and was dying to find a house to live in. Tim spent practically every day searching for our new home. We would go into a house and immediately I would say “this looks fine, let’s buy it.” “But T,” Tim would say “the house is falling down the hill.” Or “But T, it backs up to the freeway.” After about a month of this we found our little ranch house on a cul-de-sac. 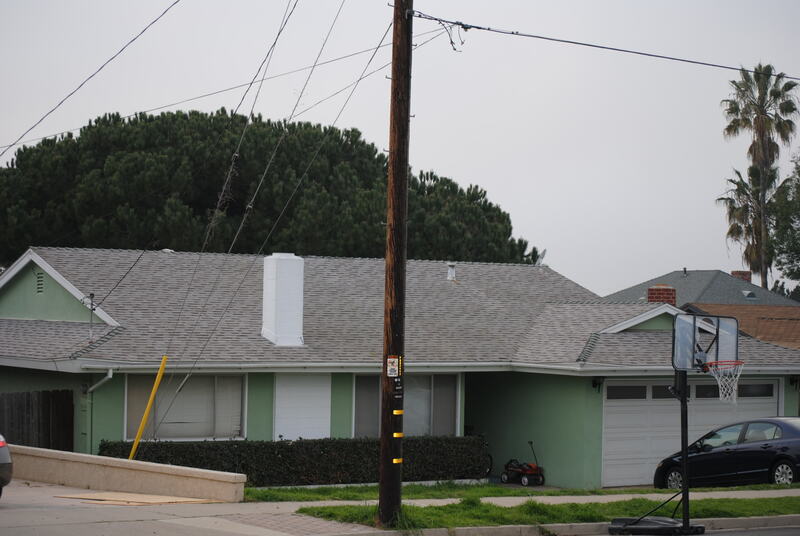 I heard Tim on the phone making the deal for our house thinking that we had really overpaid (Really, who pays $230,000 for a silly little stucco box in Carlsbad a mile from the beach?! ), but I was desperate so I agreed to the deal. Our house was built about forty years ago. Some developers bought an old chicken ranch, built 12 houses in a cul-de-sac, and called it Glenview Estates. Pretty funny considering we do not have a view of any glen and the houses certainly are not estates. There are only two styles of houses on our cul-de-sac and they all have curtain walls The neighbors go into each other’s houses looking at how the homes have evolved in past four decades. One neighbor with our model took out a wall to make the living room larger; another took out a wall to make the family room larger. In our house, the previous owners left the walls alone, but built an addition on the back porch which they used as a dining room. This left us with four small bedrooms and two very small bathrooms, along a skinny dark hallway. We have what real estate agents call a “peek” view of the ocean which means if you stand in a certain place in the back yard you can see a tiny bit of the beautiful, blue Pacific. As soon as we moved in we started dreaming about remodeling the house and putting on a second floor. We had vague plans and simplistic drawings, and we talked obsessively about what we wanted, so we naturally assumed we would be able to design the remodel ourselves. My friend at school even generously offered to show us how to use a computer program to aid in our design. It took about an hour of wrestling with the program before we realized that we really did need an expert… badly. We wandered around Carlsbad for a week or so looking at the modern houses we liked and found that one architect’s name kept coming up: Samuel B. Wright. Grandson of Frank Lloyd Wright? Perhaps. Sam came to our house, inspected the existing floor plan, and sat for hours and listened to our ideas and dreams about what we wanted. He seemed not to take many notes, but was thoughtful in the questions he asked. A week later he came by with preliminary floor plans. Except for some very minor changes, the plans were just what Tim and I envisioned. Even better. The elevations were next. What could we do to make our ranch house interesting, but not too weird for the neighborhood? Tim and I were thinking along the lines of The Incredible’s house, with a butterfly roof and everything. I love The Incredible’s house and would move in today, even with the obvious two dimensional drawbacks. It is elegant and Eichleresque. Oh my butterfly! Sam obliged, drew up plans, and even made a model. It was good, but not right. Tim said it looked like the front of a condo development which made us all cringe. We just don’t have wide enough lot for it to look like home of super-power heroes. Undaunted, Sam came back in a week with ANOTHER model with a wedge instead of a butterfly. At first I was unmoved by the wedge, but eventually I came around. 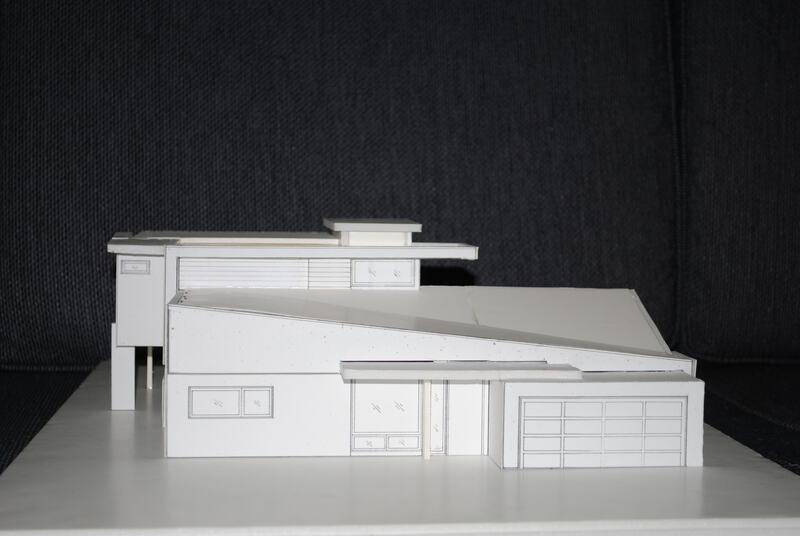 Sam is an old school architect who hand draws the plans and makes 3D models. I really appreciate his style. It is true that you can do a lot with a computer model. I have seen how you can manipulate the images easily and get various views at a touch of a keystroke. The trouble is that you have to be at your computer to do all of that, so you are consciously thinking about the house and your preconceived ideas of what you want. 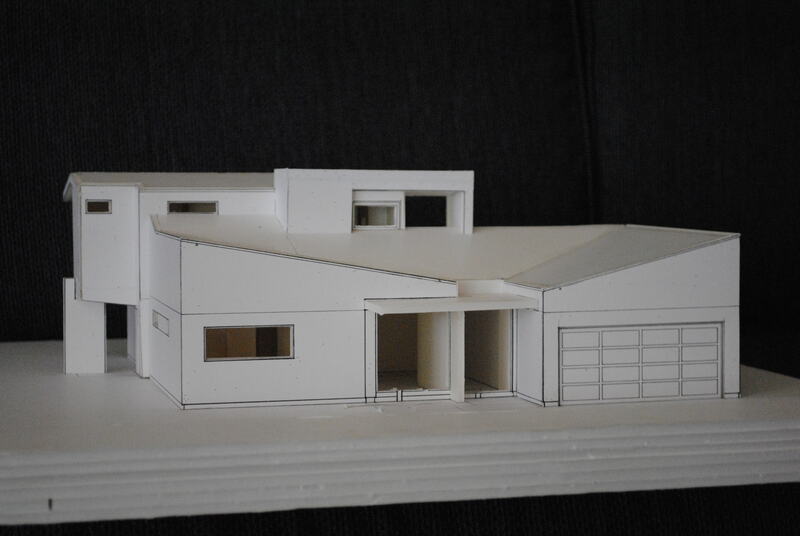 Having the models lying around for a week while we were deciding on the roofline meant that I would be traipsing through the living room, not thinking about the remodel, and the models would catch my eye. It was at those moments that the wedge sang to me. The lines seemed cleaner and less contrived than the butterfly. I was really sold when Sam told me that with the wedge my closet would be much bigger and we could have a hatch that leads to a secret overlook on our flat roof. So, out with the butterfly and in with the wedge. Next: Getting this project going. One chilly November morning I was walking barefoot in the kitchen and noticed a place under the tile floor that was hot. I called Tim over to see what he thought. He said it was probably warm because the oven was on. 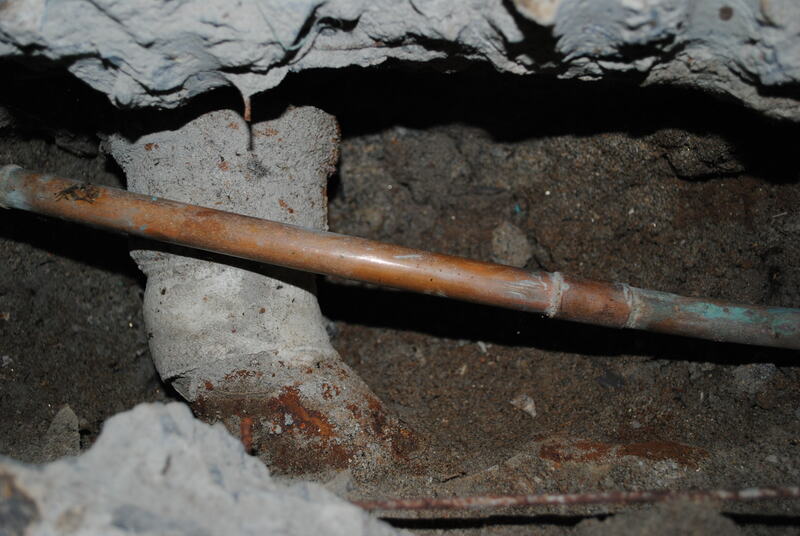 It took about a week of denying the obvious problem before we admitted that we had a leak in a hot water pipe that lived under the slab. It took another week to realize that this wasn’t just cheap radiant floor heating and that we were going to have to do something about it. Tim’s brother Sean, a contractor in Burlington Vermont, was visiting and told us the bad news. 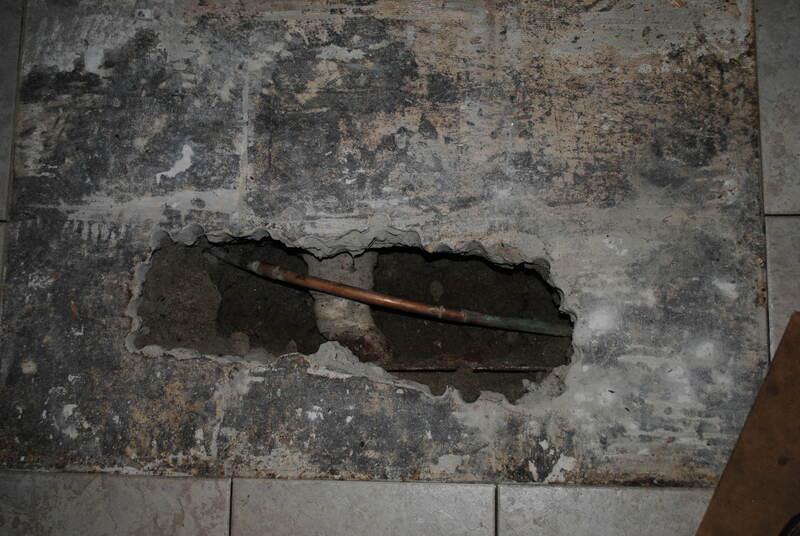 We would either have to reroute the pipes through the attic or jackhammer a hole in the slab and repair the leak. Either way we were facing a big mess in the kitchen right before Christmas. Facing finals week for me and the busy Christmas season, Tim and I decided to put off the repair until the first of the year. Not wanting to saturate the slab we turned the hot water on when we wanted to bathe, wash dishes, or any other hot water related activities, and then turned it off when we were done. Instead of the melodious sounds of Christmas Carols emanating from our house you could hear “Water On!” Water Off!” Corrina and Sam came home for Christmas and we had a great time in spite of our hot water issues, maybe because of the hot water issues. One evening we were trying to maximize our hot water use so we were making dinner, washing dishes, and running a load of laundry through the washing machine. Depression era American folk music was on the stereo adding to the ambiance. Suddenly, out of nowhere, the kitchen sink started overflowing. Corrina, Sam, and Joey sprung into action with piles of towels to sop up the water. Tim ran into the garage to turn off the water. I didn’t know whether to laugh or cry, but laughter won out and our festivities continued unabated. Tim and I have always wanted to add a second story onto our house to capture the ocean view. We planned to wait until after our kids were out of college, but with interest rates so low, and an expensive repair on the horizon we went in search of financing for our dream remodel. The loan process was a series of good news, bad news. Bad news—there is a leak in the slab. Good news—interest rates are at a forty year low. Bad news—housing values have dropped significantly in our area. Good news—the appraisal came in high enough for us to get the money we need. Bad news—the room that the previous owners added onto the back of our house was never permitted so the appraisal has to be redone. Good news—we still have enough equity to get the loan we need. Bad news—the loan is going to be more expensive than we thought so we might have to unwind the whole deal. Good news—the mortgage broker reduced the points to make the deal go through. Yea! We got a nice fat check and it is time to get going! Next time: The Design Process.